Get the Fridge Defend - be COOL be SAFE! The essence of the Fridge Defend is your carefree RV experience. 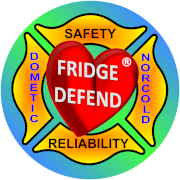 A fully functioning RV refrigerator is what the Fridge Defend is all about. The Fridge Defend is essential to the reliability, efficiency, and safety of your Dometic or Norcold fridge. WHO ARE WE? : We are RV'ers just like you. We have been using Dometic and Norcold products for 60 years. Our camping experience taught us that if we have a reliable fridge, we are happy campers! THE ARP CONTROL: Our approach to solving the problems with Dometic and Norcold RV refrigerators was so novel that we were awarded a patent for our efforts. Our patent name is the Absorption Refrigeration Protective Control. THE FRIDGE DEFEND SOLVES PROBLEMS: Not understanding marketing, but being the best at solving problems, we named our product the ARP Control, the same as our patent. But the name ARP did not tell our customers what our product does! 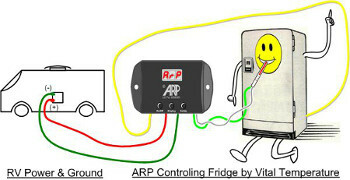 The ARP defends your fridge from premature failure while increasing efficiency and safety. Thus the Fridge Defend was coined by one of our customers when she exclaimed "I refuse to travel without my fridge defended by the ARP ". READY FOR PRICING & PRODUCT DETAILS? CLICK HERE. 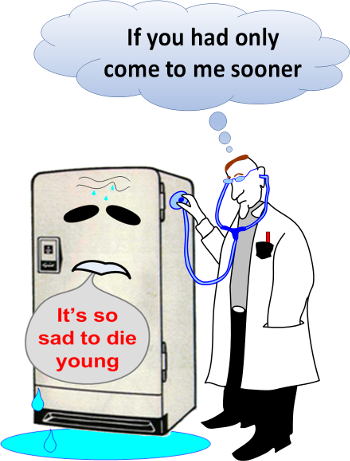 The Fridge Defend monitors the vital signs of your fridge and solves problems before they happen. 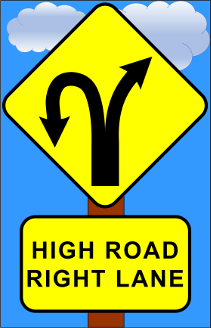 Your RV Refrigerator boiler operates at about 350 degrees all the time, but even a brief time off-level, like driving up or down a hill	, can send that temperature sky-rocketing. Events like this produced a lot of thermal stress in the fridge boiler, stress that causes the metal to fatigue and the anti-corrosion chemicals in the coolant to deteriorate leading to premature fridge failure and perhaps even causing a total fridge meltdown. The Fridge Defend by ARP can monitor the boiler temperature and automatically shut down the boiler if temperatures begin to climb out of normal range. Best of all, the Fridge Defend by ARP continues to monitor and re-starts the fridge once it cools down again, so that your food doesn't spoil. And all without any effort by you! LET US KNOW HOW WE CAN HELP? : ARPrv wants to help with all your needs for Dometic and Norcold refrigerators. If you cannot find what you are looking for please use the Contact Us form. We have all heard about the series of recalls for Dometic and Norcold RV refrigerators. 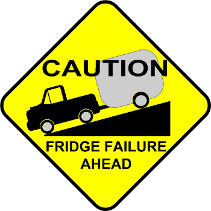 These recalls attempt to address premature refrigerator failure and catastrophic rupture type failures. As a frustrated consumer, the inventor of the patented Fridge Defend by ARP found what made these once reliable refrigerators vulnerable to damage, both long term and immediate. The source of many of these issues is a lack of active temperature management of the cooling unit which allows it to overheat on a regular basis, causing slow but cumulative damage that can result in a no cooling situation which may have otherwise been avoided. The Fridge Defend by ARP addresses these problems with a more sophisticated management technique that controls the cooling unit better, plus it has the major advantage that it will automatically re-start the fridge cooling unit after a high temperature cut-off. This avoids the loss of the food kept in the fridge. The ARP Control has been designed to be simple on the outside making it easy for Dometic and Norcold installation. The Dometic and Norcold recalls and controls do a great job for what they are designed to do. These factory controls keep the inside of your fridge cold, but do not keep the refrigerator heating system from overheating the cooling unit. Because the Fridge Defend by ARP is designed by a controls system engineer, the inside of the ARP has a smart control scheme. Smart means that you enjoy your adventure and the Fridge Defend keeps your fridge running safe. This smart method senses overheating situations and automatically turns off the heaters, then restarts the fridge when it is safe, usually before the inside of your fridge can warm at all. HOW DO YOU KNOW THE ARP CONTROL IS BETTER? The answer to the above questions is easy, when industry sees the benefits of the patented product, then attempts to patent it for them self! What Products are Offered by ARPC LLC? Please click here to go to our customer review/rating page. Star Rating: Super great service. Paul went out of his way help me while I installed the ARP Basic unit in a friends Class A motor home. I installed an ARP with fan control in my Class A MH. I just love how the Fan Control has improved the cooling in my Norcold. So what is up with the bar graphs and the testimony from LaPlatrosa? Out of the total number of customer ratings, these graphs show how many people that bought the Fridge Defend by ARP and felt that their family was safer, their fridge was more reliable, and that the ARP + Fan Control made their fridge more efficient. Please note that none of the pets that were left alone in the RV reported , but an independent survey (the dog next door) stated that 100% of pets insist their master is goofy if they do not purchase a Fridge Defend by ARP Control for safety. LaPlatrosa left this review of the ARP Control on 9/5/2015, we love Happy Campers! Please click the image to the left to see a simple example of how the ARP protects your Dometic or Norcold fridge. Please click on the link to the left for the friendliest place on the web for anyone with an RV or an interest in RVing. Click here for Dutch Eagle research site. We are pleased to be Escapees members. Escapees club is an advocate for all RV'ers, they truly care for the welfare of their members. Learn more by clicking the image to left. Please click on image to left to view ARPrv and other high quality RV vendors supported by Escapees. Your RV Refrigerator Part 1 - How it Works like Salt and Moonshine? We are pleased to be FMCA commercial members. The FMCA takes care of it's members, see their endorsement of the Fridge Defend:. "To me the ARP Controller is a requirement!" Click here to see FMCA blog Fridge Defend by ARP Control - "we believe the ARP provides the best level of safety against potential refrigerator fires". Please click image to left to see RV Gadget Box article from Escapees magazine, May/June 2014. Reprint courtesy of Escapees RV Club.